We first brought you this news the other day, but now Nintendo has followed-up with the first official announcement that North American gamers will soon be able to enjoy their Wii consoles in a darker shade, with the machine heading to stores on May 9th. As we saw in Europe last year, the basic Wii package will also be revamped to include Wii Sports Resort and MotionPlus, remaining at the recommended retail price of $199.99. A great value in video games is about to get even better. Starting May 9, Nintendo will add new elements to the baseline Wii™ system package offered at retailers throughout the Americas. In addition to the intuitive, motion-sensing Wii Remote™ controller, Nunchuk™ controller and popular Wii Sports™ game that currently comes standard with each system purchase, every new unit will now also come packaged with Wii Sports Resort™ and the control-enhancing Wii MotionPlus™ accessory. 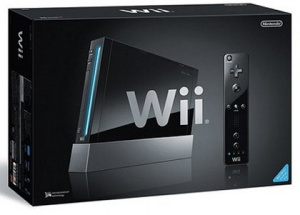 In addition, consumers will be able to choose between two color schemes for the Wii console and included controllers: original white, or a new black option. The U.S. suggested retail price of the new system package will remain at $199.99. Pricing outside the United States will be established by the local markets, but offer similar consumer value. Wii Sports Resort expands on the active-play fun of the original Wii Sports, with resort-themed activities such as wakeboarding, archery and swordplay. What’s more, Wii Sports Resort features the rich control enhancements of Wii MotionPlus, which allows users to dive in and enjoy precision motion-control excitement right out of the box. Wii MotionPlus has set the standard in precision motion control by delivering an immersive, social experience unavailable on any other system. As of May 9, when both the Wii Sports Resort game and a Wii MotionPlus accessory will come standard with every new Wii console, people who purchase the system can experience this leading-edge video game technology from the moment they plug in and power up. Previously unavailable throughout the Americas, the black version of the Wii console will offer all the groundbreaking features and functions of its white counterpart in a stylish new color scheme. Whether they aim to color-coordinate with other devices or simply love the way it looks, consumers throughout the Americas can add a black Wii console with matching black Wii Remote and Nunchuk controllers to their home entertainment lineup. Additional black controllers and accessories can be purchased separately. It's a stunning, slick design, I wish I had one, but I have not found any official way to move the NAND of my white Wii to a new black one, Nintendo has some oversights on this that they should fix... it's just as bad with people with DSi who want to upgrade to DSi XL, they can't move thir DSiWare purchases to a new model. It's the same issue here, sadly. But if didn't jump on the Wii wagon before, this is your best choice, not even because of the new color, but the bundle itself. If you get this and Monster Hunter Tri pack with the Classic Pro, you're set for life. @Shiryu: There is an official way. I phoned Nintendo when the black Wii was released in the UK, and they said they'd be able to transfer my shop channel account, with all the WiiWare/VC games I bought, from one Wii to another, for free. The problem is, you have to send both the Wiis to there repair offices for them to do that, and I don't fancy paying £180 for something, then having to send it off and not see it for a month. They really, really need to address the license and save file transfer issue. I would like this bundle, but without the ability to transfer everything myself it's not happening. Sending off the Wii's to have it done by Nintendo? They've got to be kidding. Surely they could put out a do-it-yourself transfer kit. Dang. Makes me wish I waited. Could've had $100 extra bucks to buy games right now. I took my Wii apart and put the motherboard inside the black Wii casing. Black Wii with all my save files, purchases and messages/play history etc intact. Well, that explains why GameStop extended the deal where they gave away Wii Sports Resort with every Wii sold...they wanted to get rid of stock before it became a pack-in title! And avoid people putting off purchases due to rumors, I suspect. What does NAND stand for? Wow, I think that's a pretty good deal by/for Nintendo. With the new color and add-ins they may not have to lower prices this holiday season, plus getting the Motion Plus out there may encourage more games to take advantage of it and maybe some of them will be good enough to help against the Move competition. If I were Nintendo I would certainly be playing up $199 includes Motion Plus and Sports and Sports Resort rather than a ~$100 Move add-on. That happiness aside, my 3 1/2 yr. old Wii has been acting up lately so I was really excited to see this, but Nintendo MUST - and I repeat MUST - come up with a 1 time transfer option for my Wii downloaded purchases. Having to send it in is stupid. Even if they have to wipe my old memory clean I should be able to download my paid for games to a new system. It never actually even occurred to me until now that I wouldn't be able to. Maybe I'll hold off on spending my 2500 Wii card points until I think this through. I want a black Wii, but I don't feel like sending the consoles to Nintendo just so they can transfer all my data to the black Wii. That's a little ridiculous. It's too bad for Nintendo because I know a lot of people who would buy a black Wii, but they won't because there's no way for them to transfer the downloadable content themselves. Hard to believe it took 3 1/2 years for the U.S. to get a black Wii. I'm fine with my original white one, I could care less about the color. In fact, white is always less dusty. Three-and-a-years too late Nintendo. .
should've been an option at launch.if there was, then i would of picked black.but i already have the white Wii,and buying another one would be a waste of money.but this is a good deal for those who havent bought one,or theres is broken. Well, now I can tell my friend about this. Wow what a deal. That is going to spike sales. yeah, i think if they did make it simple to transfer everything between wii's they would sell a hell of a lot more black ones. i know tons of gamers (myself included) that would shell out for this just because of the color. Nintendo's answer to the Slim PS3 & it's PlayStation Move. Just repainted everything from the original white Wii package to black, add Motion+ with an extra game, and you got a brand spanking new alternative. Why do they need the Wii I already have? Why can't they just look up my Nintendo Club account with all my games and serial numbers? Isn't that proof enough?